I want a HUGE cat! How much to Savannahs weigh? It depends on each savannah, Savannahs are a long lean body cat and look larger then they really weigh. Can Savannahs eat regular cat food? Yes! We recommend a high-quality canned food, or if you're so inclined, a good raw diet. Can you take them to the vet? Savannahs require the same regular veterinary care as any domestic cat. Do Savannahs get regular shots like other cats? Sv get only Feline Rhinotracheitis-Calici-Panleukopenia Vaccine. It depends on the state you need to check www.HybridLaw.com to verify if SV are legal in your area. All our cats are priced according to Type and generation. Why are Savannahs so expensive? 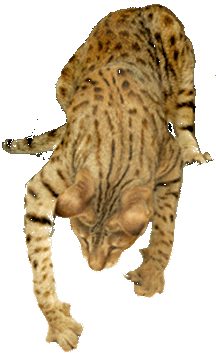 The first cross to produce a Savannah (Serval x Domestic) is very difficult. Subsequent early generations (F1-F3) are often difficult and expensive to produce, and therefore there are not many high-quality Savannahs. Hence, the price. How long do Savannahs live? Savannahs live as long as normal cats. What is a Savannah's temperament like? SV don't like to be held but they love to come and sit by you. Do Savannahs get along with other cats? It depends on the breed of the other cat and also the age.